products of the highest purity and quality. The brands we offer guarantee high quality products. They achieve this do to strict guideline implementation at every stage of production and the use of verified raw materials form proven sources. We do not offer you anything we would not buy ourselves. We represent brands that are dedicated to the production of high quality products. Thanks to this, we can guarantee that the end products coming from our suppliers are safe and effective. 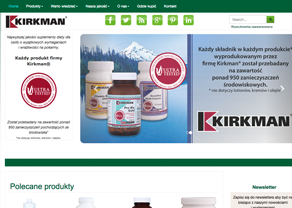 Kirkman® is a producer of the highest quality dietary supplements form the USA. Its products are dedicated to patients suffering from autism, coeliac disease, and allergies. Official Kirkman's Polish website open now!